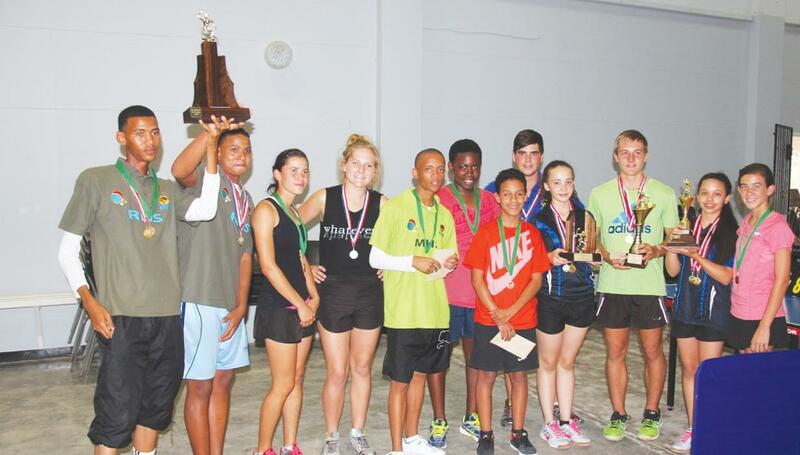 All Medal Winners (f.l.t.r): Conwin van Wyk (Boys Doubles Champion), Ronaldo Vogel (Boys Doubles Champion), Jesse Joseph, Anja Steenkamp, Delton Dreyer, Raimo Dengeinge, Kean Tait, Polla Thornburn, Kaitlyn Beukes (Girls Doubles Champion), PW Steenkamp (Boys Singles Champion), Reese Saunderson (Girls Singles + Doubles Champion) and Ciara Thornburn. Namibia’s Table Tennis youngsters went head-to-head during the third edition of the Rehoboth Open which took place at Origo Primary School in Rehoboth last Saturday. 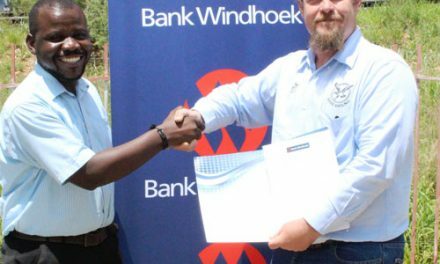 The development event saw 34 players taking part in the tourney that was hosted by the Namibian Table Tennis Association (NTTA) and sponsored by Saunderson & Co for the second consecutive year. It was the first time in NTTA history that a tournament was played based on a continuous draw method. This entailed that the players played out for every single position and they therefore played a significant number of games, unlike in a knock-out type event. “It was successful and we plan to continue using it in the future,” NTTA’s secretary Heiko Fleidl explained. In the U/18 girls division, Reese Saunderson and Kaitlyn Beukes (both Windhoek Gymnasium) continued their rivalry in style. The pair was outstanding throughout the tournament. Saunderson successfully defended her title and took home the gold medal, with Beukes in second. Nevertheless, Jesse Joseph (M & K Gertze) and Leandri Dreyer (Elnatan) showed that they are continually improving finishing 3rd and 4th consequently and that with time, they will be serious contenders for the title. In the girls double section Saunderson and Beukes teamed up and clinched the gold medal. They were, however, made to work extremely hard for their prestigious title. In other action, PW Steenkamp (Elnatan) took top honours in the boy’s category while in the U/18 Boys doubles section, Vogel and Conwin van Wyk (local Rehoboth players) had the last laugh as they cruised to a much celebrated victory, leaving Steenkamp and his partner Polla Thornburn (Elnatan) behind them. The third place went to Kean Tait and Raimo Dengeinge (both from Windhoek).